Richard Warnica has worked in some of Canada’s top newsrooms. 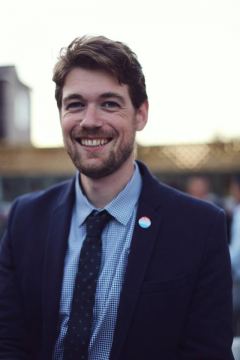 He joined The Tyee after graduating from the UBC School of Journalism in 2006. He then spent two years reporting for the Edmonton Journal, before moving east to work for Maclean’s and Canadian Business. Warnica is now a feature writer for the National Post, which he joined in 2014. He’s covered the fall of Toronto mayor Rob Ford, the rise of Donald Trump and, most recently, the growth of Canada’s far right. What’s your day-to-day role at the National Post? I was hired to write for the Toronto section near the tail end of the Rob Ford mayoralty. As soon as he left, they got rid of the Toronto section. I was without a home for a while and jumped around. I did some crime and politics stuff and gravitated more and more towards features. I covered on and off the U.S. election last year, including the primaries and conventions. Once I came back from the conventions, I started writing features full time. You got a lot of attention recently with the feature you wrote about Ezra Levant and the rise of Rebel Media. What drew you to the topic? It weirdly goes back to covering Trump. I covered the really early days of Trump in Iowa and New Hampshire. Up until election day, like most people I thought, ‘This guy can’t win. Nothing’s going to happen here.’ When he won, I had a moment as a reporter where I realized there were a lot of signs everywhere I went. There was tremendous enthusiasm. Why did I as a reporter miss those signs? And what am I doing in my reporting in Canada that might be similar? That led me to do a piece on Kellie Lietch that came out in December. The people running her campaign were smart people with good political minds, and I thought, if they have her filling this message about Canadian values, they’re doing because they think it will resonate. I wanted to find out who it was resonating with. After I filed that story, I was poking around, trying to figure out the next thing. I went to Rebel Media’s rally in Toronto. I wasn’t sure what I wanted to write about them. I came out from that thinking there’s a story here. I don’t quite know what it is yet, but it’s something I should dig into. What was your reaction to the reader response? I got a lot of angry emails. But I got a lot of positive stuff, too. When you work on something for a really long time, a big readership is validating. It makes me think I didn’t waste several months of my life. How did you end up at UBC Journalism? I did my undergrad at the University of Victoria. I started out wanting to be a fiction writer, so I enrolled in the creative writing department. I totally bombed out. I lasted till Thanksgiving and just couldn’t do it. I knew I wanted to write, but I couldn’t figure out a way to do it. So I switched to political science. It wasn’t until my fourth year that I started writing a bit for the student newspaper. I was just writing letters to the editor about things that made me mad. Then I ran into one of the editors in the SUB building and he said, ‘You’ve written enough that you’re a contributor. If you ever want to come to a meeting, feel free.’ I did and I loved it and came back the year after I graduated and worked at the paper as sports editor for a year. As for UBC, I wanted to live in Vancouver. The pitch of the School was journalism, but also grad-level education. I liked the idea of that. What was the most valuable lesson you learned at the School? That infectious idea of finding something that hooks people and that matters. If you ever hooked the faculty on an idea, their eyes would light up and they’d say, ‘You’ve got a good one.’ if you run it down and you hit it hard enough, you’ll get the story. That’s all that really matters. That’s what really stuck with me. How did you benefit from the School’s network? I got my first internship by hanging outside of David Beers office until he talked to me. Then he gave me a job at The Tyee after I did the internship. It was my work there that I think got me other jobs. There are hustlers out there who don’t need j-school and who can find their way in the world. But I was not that person. I wouldn’t have just cold called a bunch of editors a thousand times until I got something. The institutional idea that you’re a journalist now and are allowed to go after these things was important to me. What are your fondest memories at the School? I made some really good friends. The Thunderbird when I started came out once a semester. We were able to talk the faculty into letting us put it out once a week. We then turned it into a blog that would publish multiple times a day. That was really fun. It’s a small group and you’re in class with all the same people all the time. People married people from the School. Some are still best friends. It’s a tight group. The work that’s done in the School is known in the industry and respected. I’ve seen UBC grads come through as interns and they’re smart and well-trained. They also come in with a different perspective on being a journalist than when you train in central Canada. Find the work that speaks to you and put yourself in positions to do that work. If you’re into documentaries, find a way to be working on those skills. Watch them and absorb as much as possible. For me, it was feature writing. Years later I figured out the base skills to do that well. What I did have when I was younger was this vague sense that this was the kind of work I was interested in. I needed to learn how to report and write and putting the building blocks of a story together. It’s been an extremely weird time to come up in this industry. It’s going to continue to feel like that. But I think it’s valuable, fascinating and invigorating work. Journalism school is a place to introduce yourself to that world. Use the next two years as an opportunity to learn whether it’s something you really want to do. There’s no shame in deciding it isn’t and having a different life.